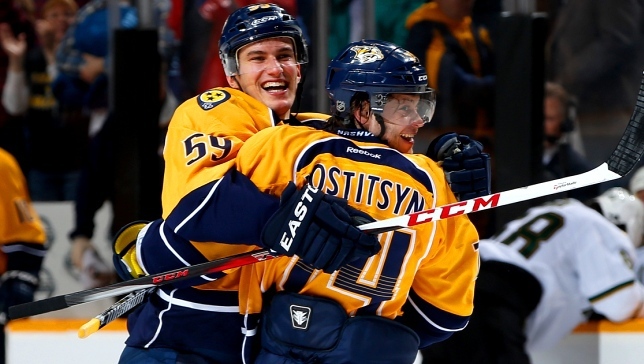 Nashville, Tenn. – Nashville Predators President of Hockey Operations/General Manager David Poile announced today that the club has signed defenseman Roman Josi to a seven-year, $28 million contract. He will make $2.5 million in 2013-14, $3 million in 2014-15, $4 million in 2015-16, $4.25 million in 2016-17, $5 million in 2017-18, $5.25 million in 2018-19 and $4 million in 2019-20. Josi, 23 (6/1/90), posted 18 points (5g-13a) while appearing in all 48 of Nashville’s games in 2012-13, surpassing his 52-game total from his rookie campaign in 2011-12. The Bern, Switzerland native saw his average ice time increase by more than five minutes from his rookie campaign (from 18:23 to 23:31), leading the team in ice time on nine occasions while ranking 19th in the League in total minutes played (1,129:25) last season. The 6-2, 198-pound blueliner had a standout 2013 World Championships, becoming the first Swiss player to be named Most Valuable Player, Best Defenseman and a tournament All-Star after helping Switzerland to a silver medal, the nation’s first medal in 60 years. Josi led all tournament defensemen in goals (4) and points (9), in addition to leading Switzerland in points and average ice time (20:08). Nashville’s third choice, 38th overall (second round), in the 2008 Entry Draft, Josi has posted 34 points (10g-24a) in 100 regular-season games.